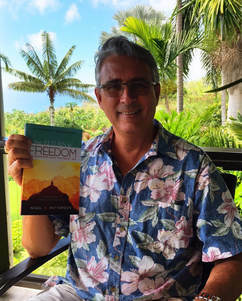 When consulting with clients and audience members, Nigel uses his groundbreaking Path to Freedom Model from his book, Your RETURN to FREEDOM: A Practical Guide to Finding Lasting Inner Peace. His clients are led on a journey to finding freedom—from living a life of meaningless conformance to a life of purpose and liberation. With this new-found freedom they truly can embrace love, happiness and compassion. His path led him to move to Sydney, Australia where he further developed his deep connection with Spirit. In 2009 Nigel was ordained as a Reverend of the Church of United Spiritualism of Australia. In 2010 he graduated as a Transpersonal Counsellor and started a practice supporting clients through their own transformations, both individually and in group sessions. ​Today, Nigel lives in beautiful Hawaii on the Big Island with his husband, a cat and a dog. In between writing, public speaking and conducting workshops, Nigel continues to support his clients remotely. Click here to connect with Nigel.